We have diverged from this path by using the most expensive and high-tech materials available while limiting the size of our bags to accommodate the essentials and wrapping the whole package in a functional, yet minimalist design. Today, Odyssean launches The Urban Series on Kickstarter with a funding goal of $25,000. 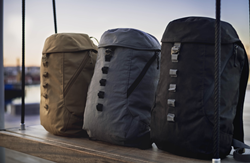 The Urban 30 and Urban 30 Pro models offer a military grade backpack that promises to keep belongings safe while maintaining a sleek design that can be taken from the office to the next adventure. The Urban 30 backpack offers a spacious main compartment that fits everything needed for the daily grind or a weekend getaway. Inside, there are two mesh zippered pockets that keep essentials safe and easy to find. The top lid offers handy, on-the-go storage for often-grabbed items like sunglasses. The two outside zip compartments are low profile with the zipper sliders tucking neatly under the top flap. The Urban 30 Pro gives users quick and easy access to their laptop with a side zipper padded sleeve that fits a 15-inch laptop. Additionally, The Urban Series offers CORDURA® and Dyneema® fabric technologies for their backpacks. CORDURA® is a collection of fabric technologies known for their durability and resistance to abrasions, tears and scuffs. CORDURA® is widely known and used in a wide array of high-quality products including luggage, backpacks, trousers, military wear and performance apparel. Dyneema® is highly praised as the world's strongest, lightest fiber. The Dyneema® brand promises performance, comfort and sustainability. The Urban 30 and Urban 30 Pro both protect belongings using a classic cinch top design and top cover that latches using a classic g-hook closure for an additional closure option. The Urban Series has a full collection that includes an organizer, travel kit and wallet made tough and durable like the Urban 30. The Urban Organizer fits a pair of sneakers, pants, shirts and more all at once. The Urban Travel Kit fits toiletry essentials for a weekend or weeks on the road, and the Urban wallet comes in both bi-fold and single wallet styles. The Urban 30 and Urban 30 Pro backpacks are 20.25 inches high, 12.25 inches wide and 9.5 inches deep. The outer shell is made of Dyneema® Composite and 500d Solution Dyed Nylon CORDURA® with 200d Nylon Oxford fabric. The zippers are YKK and the hardware is ITW. For the Pro model, there are seven pockets aside from the main pocket, and for the Urban 30 model, there are six pockets aside from the main pocket. Urban 30 is available in the colors coyote and grey for the initial Kickstarter campaign, with black as a stretch goal. The Urban Series is currently available on Kickstarter starting at $195 for the Urban 30, and backers can pay an additional $70 to upgrade to the Urban 30 Pro. For more information, or to pre-order, visit pr.go2.fund/urban30. The Odyssean team spent years combining timeless historical features with modern minimalist styling to create the Urban 30 series of packs. Roman Legionaries carried flap-top bags on poles over their shoulders, American Civil War troops loaded gear in wooden-framed rucksacks, and modern militaries adapted the historical top-loading designs into complex systems of compartments, support frames, and modular attachments. They sought to combine legacy with cutting edge materials that still provide the old, rugged feeling. They then refined the design down to a sleek and minimally styled bag for your everyday Odyssey. For more information, visit https://producthype.co/urban30backpack/.